Roughly 80 percent of the U.S. population suffers from gum disease (periodontal disease). Gum disease occurs when bacterial begins to cause an infection in the gum. In its early stages (gingivitis), it is easily treatable without any long lasting implications. However, when left untreated, gingivitis can progress to periodontitis. When left untreated, it can result in tooth and bone loss. As a reputable dentist, we provide treatment for gum disease in Naples. Gum disease in its early stages is known as gingivitis. Often, many are unaware they even have the condition. Gingivitis begins to develop due to an accumulation of bacteria in the mouth. The buildup of bacteria, plaque and tarter ultimately leads to an infection along the gum line. As the infection progresses, the gums become inflamed, red and irritated. Often, the gums will begin to bleed. Overtime, this may lead to the destruction of surrounding tissue, causing the teeth to become loose and painful. Thankfully, early intervention can fully rid gum disease. However, when left untreated, gingivitis causes pockets to form in the gum line. These pockets trap additional bacterial and plaque, creating the perfect breeding ground for gum disease to intensify. As a result, the infection spreads and can lead to the gum line receding. At this point, gum disease progresses to periodontitis. The bacteria trapped in the pockets allows bacteria to flourish, increasing the risk for tooth decay. Overall, periodontitis wreaks havoc in the mouth and causes both the gums and teeth to begin to deteriorate. When left untreated, tooth and bone decay can develop, leading to the eventual loss of the tooth. When caught early, you’re able to reverse the damages of gingivitis and stop it from progressing to periodontitis. When periodontitis is present, you’ll need intervention from the dentist to treat the infection, as well as resolve the damages that have occurred as a result of the infection. Dr. Mark Makram offers periodontal therapy in Naples to help treat gum disease while repairing the damages it has caused. Dr. Makram is the go-to dentist for gum disease in Naples. He will evaluate your oral health to address the issues causing gum disease. Throughout the treatment, he will clean your teeth to remove the bacteria causing the infection and irritation. To prevent additional buildup, he may recommend additional treatments to combat the progression of the disease. Should gum disease progress to periodontitis, he offers the necessary treatments to stop the progression. 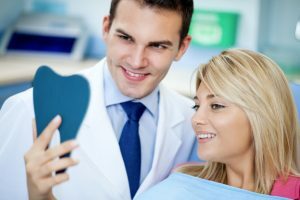 In addition, he offers the restorative procedures you need to repair any damage that has occurred, such as gum contouring, tooth restoration, and even dental implants if tooth loss has occurred. As a leading dentist in Naples, Dr. Makram will work with you to address the issues hurting your oral health. Committed to excellence and the highest degree of care, he’ll make you feel at ease while caring for your gum disease. If you’re suffering from the effects of gum disease, call Dr. Makram today to schedule a consultation.